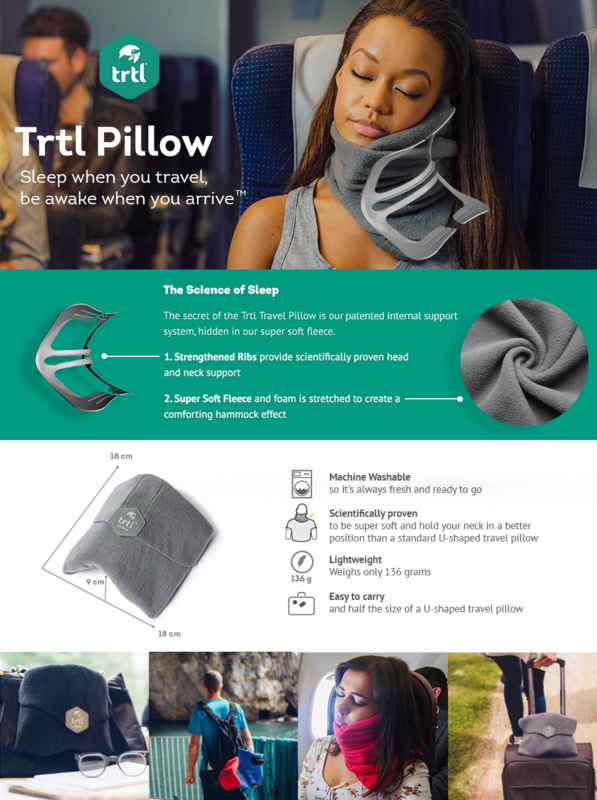 The TRTL PILLOW has been SCIENTIFICALLY PROVEN to keep your head in a BETTER POSITION when sleeping upright by holding your head in an ergonomic position during rest. No more nodding heads! SUPER SOFT fleece combined with a unique hidden internal SUPPORT, plus some EXTRA COSY CUSHIONING creates a comfortable resting place for your head and neck. Available in RED, GREY and BLACK so you can find a colour that suits your style. Our UNIQUE PATENTED DESIGN is your ticket to an awesome night’s sleep, wherever you are. Designed to look like a SCARF, the Trtl Pillow can be easily adjusted to your comfort. The Trtl Pillow is EASY TO ATTACH to the handle of your backpack or outside of your luggage, and it only WEIGHS HALF A POUND (148 grams)! Say goodbye to bulky neck pillows taking up precious space in your carry on, or weighing you down at duty free. ALWAYS FRESH and ready to go, The Trtl Pillow is also MACHINE WASHABLE!